(1) ARISIA. As of Friday at 11 p.m. Boston sff convention Arisia reported 2,873 members. The Arisia 2019 Souvenir Book is available online, and includes Jenn Jumper’s heartwarming writeup about Fan GoH’s Bjo and John Trimble. A new filming project is sweeping through Morgan County this week for a reboot television series of Steven Spielberg’s sci-fi/horror “Amazing Stories,” with shooting locations in Rutledge, Bostwick and right outside of Madison. Filming begin on Monday, Jan 14 off Highway 83 outside of Madison and then moved to Bostwick, behind the Cotton Jin on Mayor John Bostwick’s farm. Downtown Rutledge is getting a full makeover this week for the filming project, which will shoot on Friday, Jan 18 and run into the wee hours of Saturday, Jan 19. Rutledge’s iconic gazebo underwent a paint job for the filming, and on Wednesday, Jan. 16, crews began covering the intersection of Fairplay Road and Main Street with dirt. (3) GETTING BETTER. The second story in The Verge’s “Better Worlds” project has been posted — “Online Reunion” by Leigh Alexander. As an alternative to the text, you can listen to the audio adaptation of “Online Reunion” at Apple Podcasts, Pocket Casts, or Spotify. In “Online Reunion,” author Leigh Alexander imagines a world in which a young journalist is struggling with a compulsive “time sickness,” so she sets out to write a tearjerker about a widow reconnecting with her dead husband’s e-pet — but she finds something very different waiting for her in the internet ether. A self-described “recovering journalist” with a decade of experience writing about video games and technology, Alexander has since branched out into fiction, including an official Netrunner book, Monitor, and narrative design work for games like Reigns: Her Majesty and Reigns: Game of Thrones. The Verge spoke with Alexander about finding joy and connection online, preserving digital history, and seeing the mystical in the technological. (4) FANTASTIC FICTION AT KGB. Ellen Datlow has posted her photos from the series’ January 16 event. 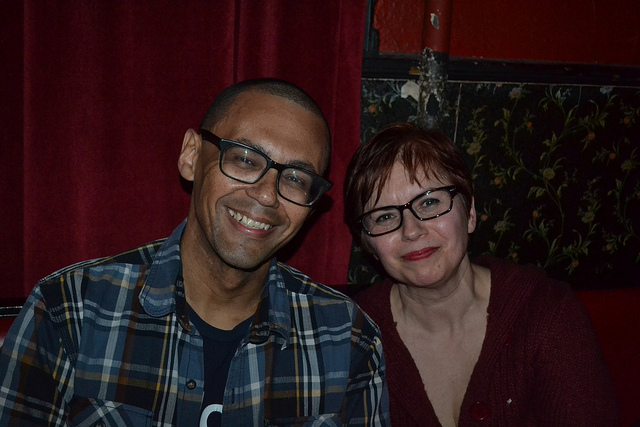 Victor LaValle and Julie C. Day entertained a huge audience with their readings. Victor read from a new novella and Julie read two of her short stories. (5) THE FIRST DOESN’T LAST. Critics say they made Mars boring: “‘The First’ Canceled at Hulu After One Season”. (6) BRADBURY OBIT. Bettina Bradbury, Ray Bradbury’s daughter, died January 13 at the age of 64 announced the Ray Bradbury Experience Museum on Facebook. SoapHub paid tribute: “Longtime Soap Opera Scribe Dies At 64”. NBC’s Santa Barbara was her first soap writing team in the early 1990s. She also wrote for both All My Children (and won three Daytime Emmys) and One Life to Live on ABC and later worked on Days of Our Lives, also for NBC. (7) DAVIES OBIT. [By Steve Green.] Windsor Davies (1930-2019): British actor, died January 17, aged 88. Genre appearances include The Corridor People (one episode, 1966), Adam Adamant Lives! (one episode, 1967), Doctor Who (three episodes, 1967), Frankenstein Must Be Destroyed (1969), UFO (one episode, 1970), The Guardians (one episode, 1971), The Donation Conspiracy (two episodes, 1973), Alice in Wonderland (one episode, 1985), Terrahawks (voice role, 39 episodes, 1983-86), Rupert and the Frog Song (1985), Gormenghast (two episodes, 2000). Born January 19, 1932 – Richard Lester, 87. Director best known for his 1980s Superman films. He’s got a number of other genre films including the exceedingly silly The Mouse on the Moon, Robin and Marian which may be my favorite Robin Hood film ever, and an entire excellent series of Musketeers films. He also directed Royal Flash based on George MacDonald Fraser’s Flashman novel of that name. Born January 19, 1981 – Bitsie Tulloch, 38. Her main role of interest to us was as Juliette Silverton/Eve in Grimm. She also has played Lois Lane in the recent Elseworlds episodes of this Arrowverse season. However I also found her in R2-D2: Beneath the Dome, a fan made film that use fake interviews, fake archive photos, film clips, and behind-the-scenes footage to tell early life of that droid. You can see it and her in it here. (9) DRAWN TO POE. Crimereads celebrates the author’s birthday with “The 25 Most Terrifyingly Beautiful Edgar Allan Poe Illustrations”. Harry Clarke and Gustav Doré are heavily represented. Since it’s the season for basking in all things dreadful, we decided to round up twenty-five of the greatest illustrations ever made for Poe’s work. 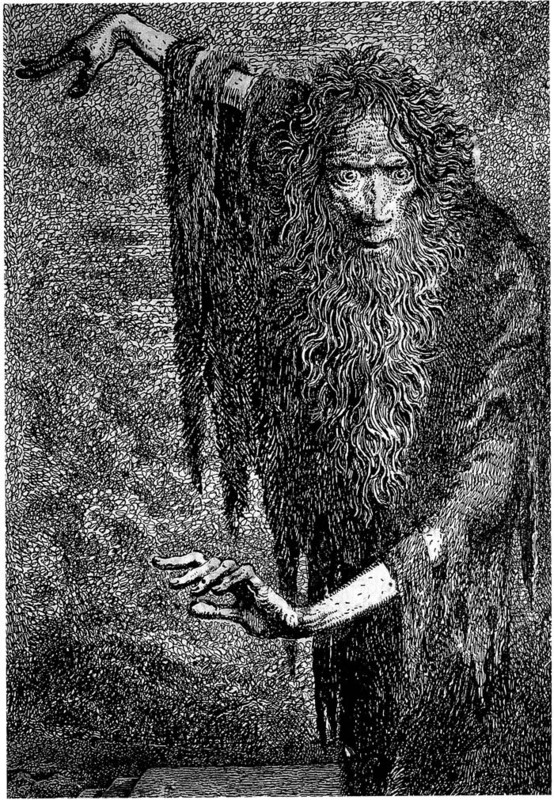 Some are more terrifying, others more beautiful, but all fall somewhere on the spectrum of terrifyingly beautiful, and we can’t stop looking at them, just as we can’t stop reading the works of the great Edgar Allan Poe. (10) FAUX POES. Emily Temple undertakes “A Brief and Incomplete Survey of Edgar Allan Poes in Pop Culture” for LitHub readers. What’s the first image that pops into your head when you think of Edgar Allan Poe? Is it this ubiquitous one? Maybe it’s that snapshot of your old roommate from Halloween 2011, when she tied a fake bird to her arm and knocked everyone’s champagne glasses over with it. (Just me?) Or is it an image of Poe in one of his many pop culture incarnations? You wouldn’t be alone. After all, Poe pops up frequently in contemporary culture—somewhat more frequently than you might expect for someone who, during his lifetime, was mostly known as a caustic literary critic, even if he did turn out to be massively influential. I mean, it’s not like you see a ton of Miltons or Eliots running around. So today, on the 210th anniversary of Poe’s birth, I have compiled a brief and wildly incomplete selection of these appearances. Note that I’ve eliminated adaptations of Poe’s works, and focused on cameos and what we’ll call “faux Poes.” Turns out it isn’t just my old roommate—lots of people really love to dress up as Edgar Allan Poe. As you probably know, Poe’s work has been massively influential on American literature. In a 1909 speech at the Author’s Club in London, Arthur Conan Doyle observed that “his tales were one of the great landmarks and starting points in the literature of the last century . . . each is a root from which a whole literature has developed. . . Where was the detective story until Poe breathed the breath of life into it?” But it’s not just his work—Poe as a figure has infiltrated a number of literary works, including this early Bradbury story, in which Poe (along with Algernon Blackwood, Ambrose Bierce, Charles Dickens, and William Shakespeare) is living on Mars, and slowly withering away as humans on Earth burn his books. The symbolism isn’t exactly subtle, but hey. (11) SHUFFLING OFF THIS MORTAL COIL. Here’s something to play on a cold winter’s night — Arkham Horror: The Card Game. Sometimes dead is better…. In theatres April 5, 2019. Based on the seminal horror novel by Stephen King, Pet Sematary follows Dr. Louis Creed (Jason Clarke), who, after relocating with his wife Rachel (Amy Seimetz) and their two young children from Boston to rural Maine, discovers a mysterious burial ground hidden deep in the woods near the family’s new home. When tragedy strikes, Louis turns to his unusual neighbor, Jud Crandall (John Lithgow), setting off a perilous chain reaction that unleashes an unfathomable evil with horrific consequences. (14) F&SF FICTION TO LOVE. Standback took to Twitter to cheer on F&SF with a round-up of his favorite stories from the magazine in 2018. The thread starts here. On the strength of this great trio, those of you nominating for not-a-Hugo award might seriously consider Benedict for the Campbell. Rare Books LA is a book fair that features more than 100 leading specialists in rare books, fine prints, photography, ephemera, maps, and more from throughout the United States, Europe, and Asia. This prestigious event takes place at the Pasadena Convention Center. Rare Books LA will compromise of numerous exhibitors. There will be 60+ exhibitors that come from around the world to showcase their rare books. Expect to discover exhibitors who also showcase photography and fine prints. To view the list of exhibitors, click here. (16) ORIGINAL SWINGERS. CNN reports “‘Missing link’ in human history confirmed after long debate”. (17) MOON PICTURES. The Farmer’s Almanac will show you “The Oldest Moon Photo”. On the night of September 1, 1849, the nearly full Moon appeared over the town of Canandaigua, New York. At 10:30 P.M., Samuel D. Humphrey slid a highly polished, silver-plated copper sheet measuring 2–¾x1–¾ inches into his camera, which was pointed at the Moon. Humphrey then exposed the light-sensitive plate to the shining Moon nine times, varying the length of exposure from 0.5 seconds to 2 minutes. After developing the plate with mercury vapor, he sent his daguerreotype to Harvard College. Louis Daguerre, the Frenchman who explained the secret of the world’s first photographic technique in 1839, had daguerreotyped a faint image of the Moon, but the plate was soon lost in a fire. John W. Draper of New York City is credited with making the first clear daguerreotype of the Moon in March 1840, but this also was destroyed in a fire. (18) THE LONG AND GRINDING ROAD. In “NASA eyes gaping holes in Mars Curiosity wheel” Cnet shares the images. The rough and rocky landscape of Mars continues to take a toll on the wheels of NASA’s Curiosity rover. As part of a routine checkup, Curiosity snapped some new images of its wheels this week. Most of the photos don’t look too alarming, but one in particular shows some dramatic holes and cracks in the aluminum. Is this a real thing? Not a hack like drawing Spock ears on a Canadian $5 bill? Yes and no. 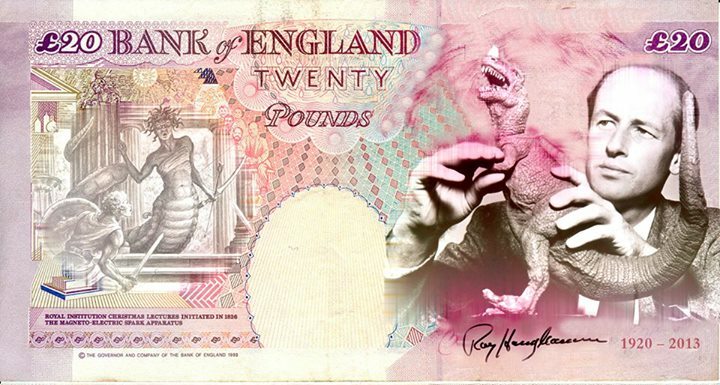 Ray Harryhausen is one of many “eligible characters” on the Bank of England’s longlist of nominees to have their image on the new £20 banknote expected to enter circulation in 2020. This mockup was tweeted by his foundation to celebrate. During a two-month public nomination period which closed yesterday, 29,701 nominations were made, covering 592 eligible visual artists. A lot of people in the film industry are on the list (Stanley Kubrick, Sylvia Anderson, Alfred Hitchcock and Richard Attenborough among them) as well as a few genre artists like Arthur Rackham and Mervyn Peake. The Bank of England’s Banknote Advisory Committee will now consider all eligible nominations and, together with input from public focus groups, produce a shortlist of 3-5 names. These will then go to the Governor for a final decision. If Harryhausen happens to be selected, that will make him the first LASFS member to appear on a financial instrument worth more than an Egobuck — a bill with Jules Verne on one side and Forry Ackerman on the other, given as a reward for service to the club in the 1960s.